Photograph taken in 2007 of eolian sedimentary deposits in the Palisades area of the Colorado River corridor, Grand Canyon, Ariz. This report summarizes a 3-year study of eolian sedimentary processes in the Colorado River corridor, Grand Canyon National Park, Ariz., and discusses the relevance of those processes to the preservation of archeologic sites. The results reported here are based on detailed sedimentologic and geomorphologic investigations in three reaches of the river corridor, as well as continuous measurements of wind, rainfall, and sand transport at six sites for as long as 26 months, short-term field study at 35 other sites, examination of historical aerial photographs, and review of data collected and analyzed during previous studies. The data generated by this study, which involved collaboration with scientists of the U.S. Geological Survey (USGS) Grand Canyon Monitoring and Research Center, the National Park Service, Northern Arizona University, the Hopi Tribe, and GeoArch, Inc., were previously published by Draut and Rubin (2005, 2006, 2008) and Draut and others (2005, in press). 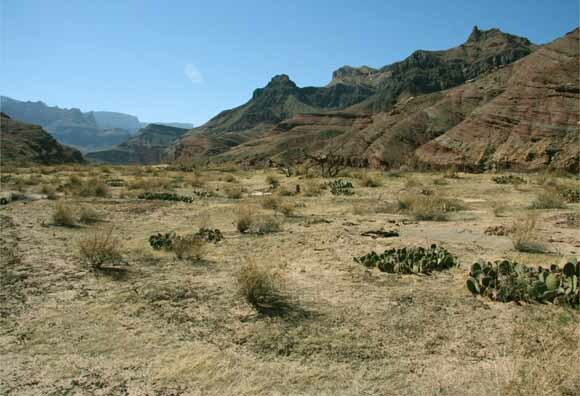 This report, which supersedes that by Draut and Rubin (2007), provides an overview of the results and contains new conclusions regarding eolian sedimentary processes in the Colorado River ecosystem and their relevance to the preservation of archeologic sites. At many of the study sites, eolian sediment serves as a substrate on which archeologic sites were formed (many sites were also built on fluvial and slopewash sediment) and, commonly, as a surficial deposit (cover) inferred to help preserve cultural materials. Over time, many cultural artifacts are exposed by wind deflation of the overlying sediment, forming a lag deposit on the land surface. Archeologic material also is vulnerable to erosion by gully incision. Incision of gullies and arroyos into sedimentary deposits during rainfall runoff is an erosive process counteracted by transport and deposition of eolian sediment because gullies are natural traps for windblown sand. The ability of eolian sediment transport to inhibit gully formation and to heal small gullies (<1 m wide or deep) is a major factor controlling the geomorphic evolution of Grand Canyon sedimentary deposits. Rainfall and sand-transport rates measured during this study showed that areas with heavy rainfall but abundant windblown sand may have no gullies (which form episodically but are quickly filled by eolian sediment), whereas areas of relatively low rainfall and low sand-transport rates can be substantially eroded by gullies and arroyos, destabilizing archeologic sites. Many eolian dunes in Grand Canyon show evidence of reduced sand supply relative to some time in the past, with vegetation and biologic soil crust covering relict duneforms. Vegetation and soil crusts indicate an absence of eolian sedimentation and a decrease in dune mobility relative to past times when the supply and transport of eolian sediment were abundant enough to form dunes. Some dunes with substantially reduced sand supply (and with well-developed vegetation and soil crust) have insufficient active eolian sedimentation to counteract gully incision; where present, large gullies and arroyos erode and degrade such dune fields and many of the archeologic sites within them.The availability and transport of eolian sediment has important implications for the management of Glen Canyon Dam operations, which regulate the flow of the Colorado River through Grand Canyon. Because fluvial sandbars now provide the greatest source of eolian sediment in the river corridor, the alongshore and cross-shore dimensions of unvegetated, dry fluvial sandbars directly affect the entrainment and transport of eolian sediment. Therefore, depending on location and wind direction, fluvial-sandbar area and dimensions also can substantially affect eolian sediment transport to dune fields in which archeologic sites are covered by windblown sand. This relation between fluvial sandbars and many of the eolian deposits in Grand Canyon implies that the availability of eolian sediment is affected by dam operations that increase or decrease the area of open, dry fluvial sedimentary deposits. An increase in sandbar area due to dam operations could increase eolian sediment transport to specific dune fields and associated archeologic sites in areas with an appropriate dominant wind direction. This report discusses criteria for evaluating the sensitivity of archeologic sites to dam operations with regard to eolian sedimentation. We distinguish two types of eolian deposit in the Colorado River corridor: (1) modern fluvial-sourced (MFS) deposits, which formed as the wind transported sand inland from a river-level sandbar, creating an eolian dune field downwind; and (2) relict fluvial-sourced (RFS) deposits, which formed as the wind eroded and redistributed sediment of extensive predam flood deposits. MFS deposits generally are smaller and more common in Grand Canyon than are RFS deposits. In areas of RFS deposits, the dominant wind direction may or may not be appropriate to transport sand from the river (non-flood-stage fluvial sandbars) to local eolian dune fields. Archeologic material is known to occur in eolian deposits of both types. Both MFS and RFS deposits are sensitive to dam operations for different reasons. MFS deposits, situated directly downwind from fluvial sandbars, receive an amount of windblown sand as a function of wind velocity, dimensions of exposed dry fluvial sandbars, and any barriers (such as vegetation) that exist between the fluvial sediment and its associated eolian deposits. Fluvial-sandbar area and riparian vegetation have been shown, by numerous studies, to respond to dam operations. Therefore, changes in either fluvial-sandbar area or riparian vegetation can affect the delivery of eolian sediment to MFS dune fields downwind. RFS deposits include eolian coppice dunes (vegetated sand mounds), which compose the uppermost, wind-reworked part of predam terraces. Predam terraces are largely alluvial in composition and contain sediment deposited by floods higher than any postdam floods have been (≥5,660 m3/s). Because sediment-rich floods of that magnitude no longer occur in this regulated river, the fluvial deposits from which extensive RFS dune fields formed no longer constitute an active sand source; no substantial new deposition is likely to occur on those dune fields as long as no large sediment-rich floods occur. As vegetation and biologic soil crust colonize RFS coppice-dune fields over time, active eolian sediment transport decreases within them, such that these areas become increasingly unable to compensate for precipitation-induced gully erosion. As a result, large gully and arroyo systems can form on predam terraces and associated RFS dune fields. Analysis of the effects of the November 2004 controlled-flood experiment on eolian sediment transport indicates that in areas where sandbars are enlarged by floods, sediment-rich controlled floods can be an effective means to restore sediment deposition locally in eolian dune fields above the controlled-flood stage. Sandbar-building riverflows of about 1,270 m3/s are much more likely to enhance eolian sedimentation on MFS than on RFS deposits because of the direct link between fluvial sandbars and MFS dune fields downwind. Our data suggest that the restoration potential for archeologic sites in eolian deposits can be optimized by using dam operations (controlled floods and postflood flows) that maximize the open sand area on fluvial sandbars during the spring windy season (April through early June), when eolian sediment transport is greatest. To effect the greatest sand transport to eolian deposits and associated archeologic material, riverflows that follow sandbar-building high flows would need to be managed to retain and maximize high-elevation, open, dry sandbar area. In spring 2005, the first windy season after the November 2004 high flow, the one study site with a clear MFS-type link between a fluvial sandbar and eolian dunes and with substantial remaining flood sediment (not entirely eroded by high fluctuating flows, as at other study sites), sand-transport rates were significantly higher than in the spring 2004 windy season. At the same site, gully erosion was effectively counteracted by deposition of eolian sediment derived from the 2004 flood deposit. If controlled high flows were followed by low fluctuating flows (as defined in the 1996 Record of Decision signed by the Secretary of the Interior) or steady low flows rather than the experimental high daily flow fluctuations that occurred from January to March 2005, windblown sand would be more likely to be transported to and deposited in gullies, and erosion of eolian deposits and associated archeologic sites might be reduced. Operating Glen Canyon Dam under low fluctuating flows (or steady low flows) between the end of a controlled flood and the start of a spring windy season is predicted to maintain the postflood sandbar area longer than in winter 2005, leaving more sand available to be blown into higher elevation dune fields during the subsequent spring windy season. Sedimentation patterns documented during this study indicate that eolian deposits above the riparian zone can respond to dam operations and that archeologic sites within these deposits can be consequently affected. The sensitivity of eolian deposits to dam operations could have either detrimental or restorative results. If reduction of open, dry fluvial-sandbar area causes a corresponding reduction in sand transport to and deposition on an eolian dune field downwind, then sand transport to and deposition on that same dune field can be enhanced by enlarging the area of the fluvial sandbar serving as a sand source for the dune field. As shown by this study, an increase in eolian sediment transport in the dune field as a result of dam operations can counteract deflation and gully incision there, potentially leading to greater preservation of associated archeologic sites. Protection of cultural artifacts in Grand Canyon on geologic time scales is unrealistic because of continual downcutting and backwasting of the bedrock canyon. However, preservation of archeologic sites likely could be enhanced on decadal to centennial time scales by restoring fluvial and eolian sedimentation that resembles more closely predam processes, including large, sediment-rich floods that once left fluvial deposits from which sediment was remobilized by wind. Download this report as a 79-page PDF file (pp1756.pdf; 25.2 MB).